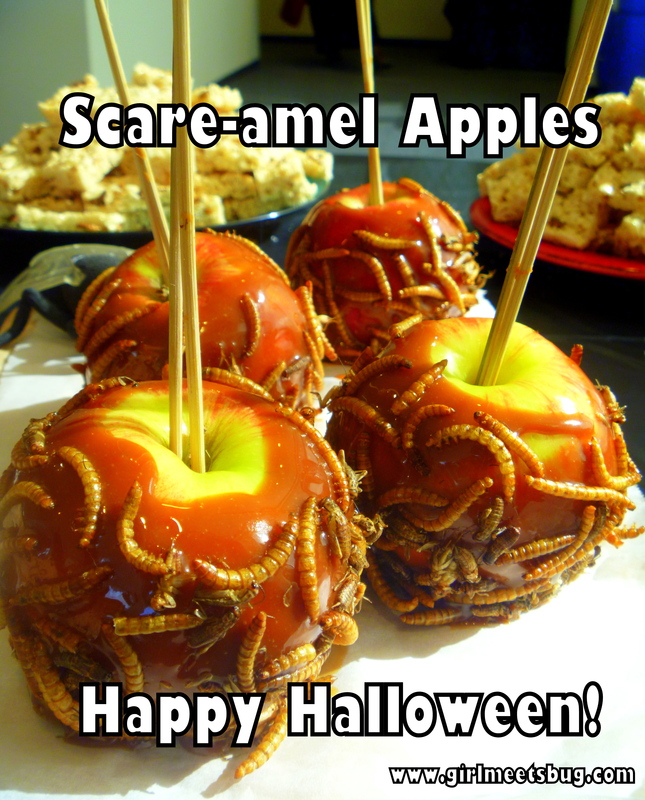 Bug out your bell-ringers or party-guests with these tricked-out treats inspired by Hotlix.com. They were a hit at a company office party – not a single bite was left over. The mealworms and crickets provide a nutty crunch and boost of protein. Except for the “thin layer” of caramel, this is a pretty healthy trick- er, treat. Bake rinsed, frozen bugs (mealworms and crickets work well for a mixed-bug look; mealworms alone will look quite snazzy) on lightly-oiled baking sheets at 350 degree for 10-15 minutes, or until golden and crunchy (will smell like roasted nuts). Be careful not to burn them. Periodically turn or shake pans to ensure uniform roasting. Shove sticks into apples’ cores, from stem to stern, so apples can sit upright. Melt a handful of caramels in a small pot on medium heat until gooey. Dip apples into caramel. Once coated, remove, allowing excess to drip off bottom. 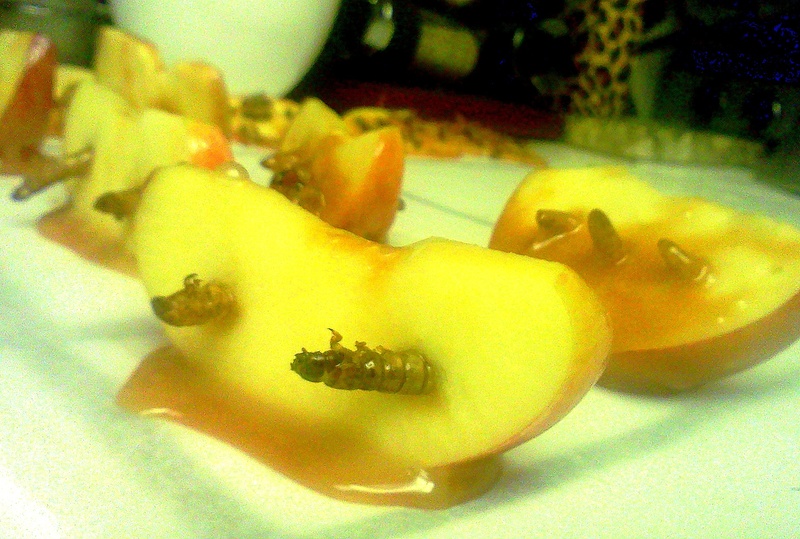 Roll apple in roasted bugs, and set to cool on waxed paper. Refrigerate until cool. Once the caramel has hardened, you can slice the apples off the sticks just before serving. Cut in stright lines around the core, and then cut smaller pieces. Bug appetit! P.S. In the background are Rice Creepy Treats. Mix any leftover roasted buglets into regular Rice Crispies Treats recipe for added nuttiness and protein! Although an interesting experiment, the caramel reacted with the moisture in the apples and became watery. They were very tasty, though! I just came up with a new recipe “on the fly,” as it were, as I was cooking lunch: an easy, 6-ingredient stir fry starring crickets as the main protein, calcium and iron source. This recipe is crazy simple. All you need is crickets, snap peas, and cabbage. Toss them in hot oil with a pinch of garlic and salt, and voila. Bug’s on! Chop snap peas and cabbage. Heat olive oil in pan or wok. 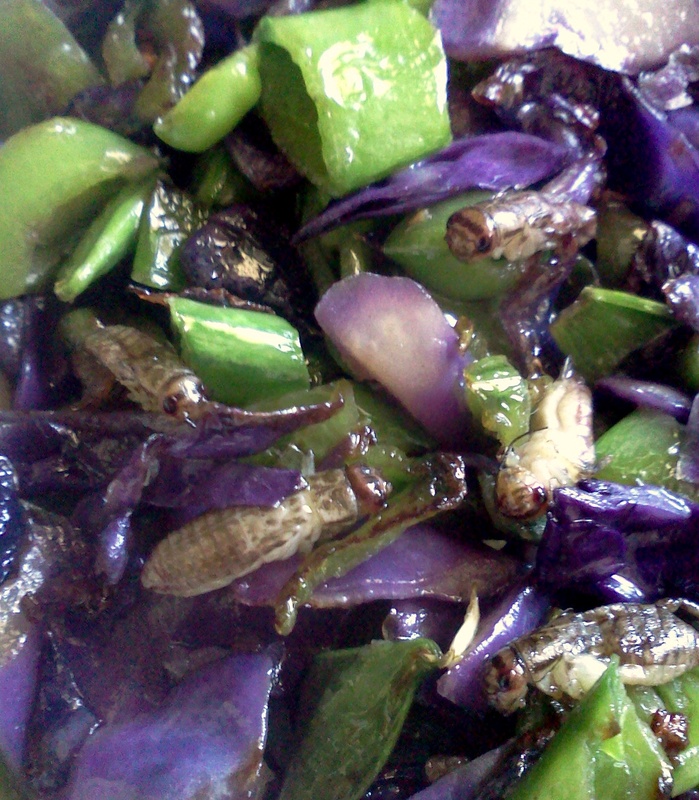 Begin stir-frying veggies and crickets. After 1 minute or so, add crushed garlic. Once cooked to desired level (I prefer mine firm and crunchy) add salt. Bug appetit! Bee larvae, when sauteed with a little butter and a few drops of honey, taste very much like bacon. Sometimes, when I talk about eating bees, I hear concern about the problems plaguing bee populations. Naturally, I would never recommend a bug-gredient that is threatened. I primarily eat drone larvae, which I get from from beekeepers whom I’ve bee-friended. Unlike worker bees, the drones’ main purpose is to mate with the queen: they do not particiapte in pollination, nurse larvae, or help with hive construction. They buzz from hive to hive to see if anyone needs any mating done, and there are generally an excess of them. It is for this reason that beekeepers often consider them a drain on colony resources. Many beekeepers have a special comb just for drones, which they sometimes use as bait for potential parastites. Saute onions in olive oil until golden, then turn heat to medium-high. Add waxworms, stirring quickly to keep them moving, while adding a pinch of salt (to taste). Waxworms will start to straighten out as they hit the heat; this means they are partially done and are becoming firm, just like shrimp or fish. When you start to see a little bit of transparency around their edges, they are ready. Simply use sauteed waxworms as you would any other taco meat, adding whichever complementary ingredients you fancy. This recipe was adapted from The Eat-A Bug Cookbook’s “Scorpion Scallopine.” For this particular recipe, I used an Emperor Scorpion, because of their low venom (this species is often kept as pets). However, if you can get your hands on a Desert Hairy scorpion, their exoskeleton is less thick and tough, so it might be ultimately tastier. Freeze live scorpions overnight, or even for several days (although it is highly unlikely, some species of scorpion have been known to re-animate once thawed, so be aware). Heat up hot oil, deep enough to immerse the scorpion. Pour buttermilk and corn meal into separate bowls, again, deep enough to immerse scorpion. Holding the scorpion with chopsticks or tongs, immerse it in the buttermilk. Let it soak for a bit, then transfer it to the cornmeal, and dredge thoroughly. Still holding it with tongs, dip it into the hot oil. Watch for cornmeal coating to become toasty-looking, and remove scorpion. If you plan to eat the stinger, at this point I would turn the scorpion tail-side down and dip just the stinger into the hot oil for 30-60 seconds. Heat is supposed to de-nature the proteins that compose the venom, but still, ingest it at your own risk. I don’t, unless the scorpion is very tiny and I know the stinger has had the heck cooked out of it. Serve scorpion with garnish, and/or a fritter or eggroll dipping sauce; a Vietnamese dipping sauce would go nicely. Love it. 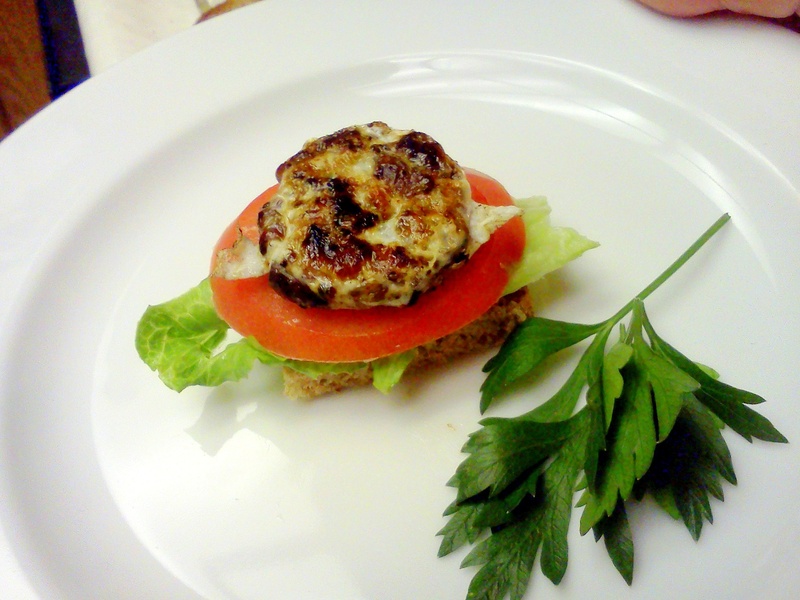 Have no problems eating insects and will try out a few of your recipes. Posted your site on my Facebook page. Giiiiiirrrl, I am SO tryin’ these out. 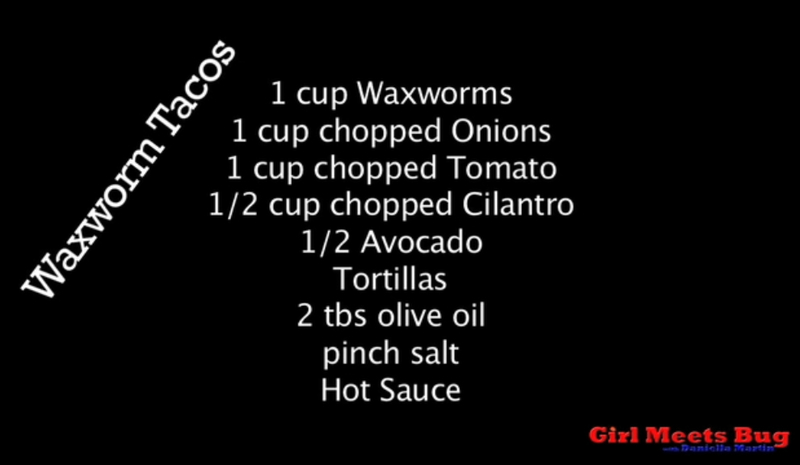 the waxworm tacos sound fab~ I’ll comment again when I make ’em. Hi Anna, I’m interested to know why you think edible insects are disgusting. This is for some research that I am doing. I haven’t actually tried any, so can’t and wouldn’t say your opinion was right or wrong. Just interested to hear a variety of people’s thoughts on the subject 🙂 Thanks. I would definitely eat it just to say I did. Hi! I’m from Indonesia. I have no idea how to get bugs around here. I’m actually just a kid who is ten, but I want to do it anyway. I especially need to know where to get those scorpions because I think there are none of them in this country! You could try pet stores, but there are lots of cool bugs in Indonesia! A lot of them are venomous, so I think you’ll want some adult assistance– and some thick gloves! I’d probably boil them for 3 minutes, first, to clean them. SO EXCITED ABOUT THIS!!! I am planning a “Family Bug Feast” night at home. . . Not sure I can get my peeps to partake, but I’m definitely going to try some of these recipes out! Do you defrost the waxworms before adding them to the sauteed onions for the tacos or just throw em in right out of the freezer? Don’t get me wrong, if you freeze an insect then at the very least it will be in stasis and so won’t feel any pain. I’m sure you’ve already attempted this recipe by now but hopefully this will help anyone else who is unsure. I will like to try these recipes as far it’s healthy. Hello!! My father-in-law has a ton of japanese bettle larvae aka grubs. I have been searching the internet for days now for recipes on how to cook them and I have not had any luck. Im a very open minded eater and would love to be able to eat these bugs instead of just throwing them out. Do you happen to know of any decent recipes? I can’t be sure exactly what brought me to inquire about preparing and eating insects, however, after only a few hours of research and a few choice online videos, I’ve found myself further intrigued and even ready to embark on this nutritional, albeit, strange culinary journey (perhaps with the less off-putting wax worm). I thank you for contributing your time and knowledge, and will be sure to be on the look-out for your future projects. Where can I purchase crickets? I’m interested in trying them. See the “Where to get bugs” section. Great stuff.Im in Africa and i must say bugs have been a stable source of nutrients from time past. Would like to know where I can pick up the book or if I can order it at Barnes and Noble. So far, the only place I know of to get it reliably is Amazon. I’m going to make some waxworm tacos with my environmental science class. Do you have an estimate of how many are in a cup? Thanks! Oh jeez. Maybe a thousand? this is great.!! Can you come up with more recipes as a request .??? ?